Our family of four had a great trip to Sri Lanka visiting both the Hill Country and the Southern Provins for ten days. We had booked Pradeep as driver who met us in Colombo and who drove us during four days through the Hill Country and down to Weligama and later picked us up to drive us back to Colombo and Negombo for our flight home again. I would recommend anybody to use Sri Lankan Safest Driver, Pradeep with family truly made a difference for our trip. 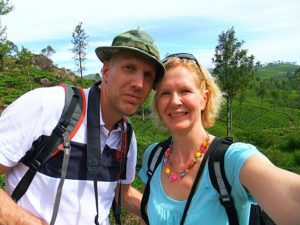 He both helped us with planning and adjusting our itinerary before our arrival as well as arrange with train tickets for us (something we had forgot/not thought about) for our trip between Nuwara Eliya and Ella. Always on time and truly a safe driver, always taking it cool in the hectic traffic. Pradeep was a great guide giving plenty of information on any question we had about Sri Lanka, it’s history or culture. He also covered local plants, fruits and animals and always gave good advice on restaurants, etc. We had a great time together with Pradeep who really made a positive difference for our visit to Sri Lanka.